Sifu Jones talks about how one energy exercise can differ quite a bit from other type ones simply in the way they are designed. Energy Exercises like the ones taught at the School that cultivate a lot of energy can be dangerous if not performed correctly. Learn why it would not be a good idea to short cut the process of building up large amounts of energy, especially when you are building up & cultivating that energy inside your own body. Colors are specific wavelengths of visible light and have accompanying energy depending on said wavelength. As your mind attempts to dial-into a specific color, so does your corresponding “healing energy”. A benchmarking is needed as to fully harness the mind’s ability to access specific colors in a repeatable fashion. This is a requirement with high level energy training to dial-in these types of precision attributes, on command and on demand, when needed; as you reach the upper echelons in Chi Energy training. It is these extreme techniques which attracted many of us to this forum will require these never-before-realized nuances of color attributes and the specific roles each color plays. If you read the article, What Color Goes to What Wavelength, you can readily see and make a correlation to colors, their wavelengths, and each color’s corresponding energy level. Although the mind interprets “white and black” as bland attributes, the science backs the training, demonstrating that the power- the energetic properties of light- is a direct result of the shorter wavelength of colors that approach (and in the case of pitch black) go beyond violet. It has been found that light can be frozen “Freeze the motion of light” and furthermore, Light can be stopped. The significance here is not on the technological process that accomplishes the freezing of light, but rather, the fact itself: light can be frozen. This means that the physical temperature, the mental concept of light, as well as any color, is malleable and can be manipulated and controlled via the mind. 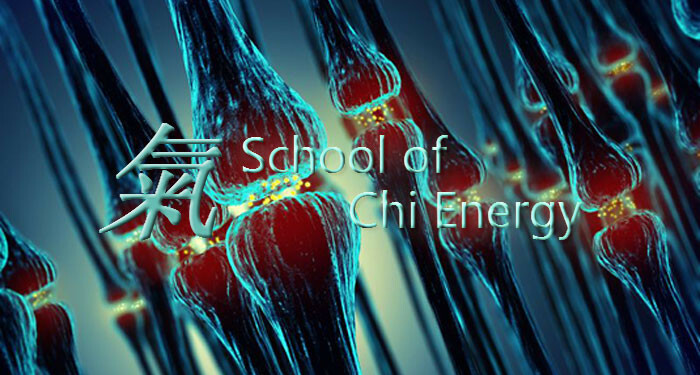 At the School of Chi Energy, we teach students how to build up high levels of biophotons in their body’s nerve fiber system. Biophotons, which are naturally projected by the nerve fibers of the body are a form of light with an electromagnetic component to them. At the School, students are taught how to cultivate large amounts of these biophotons in a safe way. Cultivating large amounts of biophotons without changing the characteristics of the biophotons, can electrically overload the body causing unwanted hormonal side effects. Side effects can include: an emotional roller coaster ride, with lows and highs, headaches, nausea, twitching muscles, organ pain and the inability to focus or concentrate; also possible irritability, depression or withdrawal and extreme emotions. 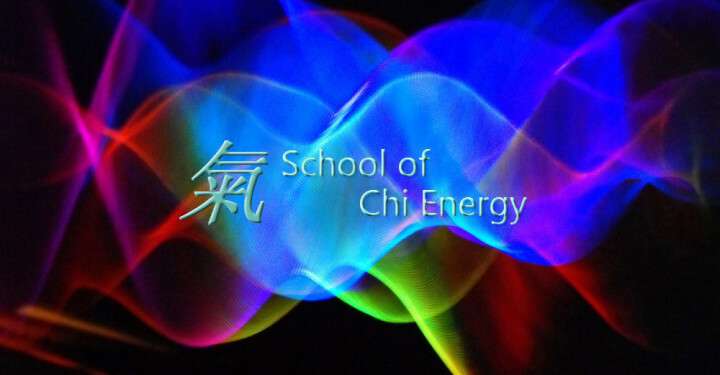 In order to safely buildup healing energy to high levels, chi energy students are taught to build this type of energy into a “specialized energy form” with a good feeling and cooling process. Students avoid using colors, breathing techniques and standing postures that leads to energy overloads. Students do not work with colors because it builds up too much heat inside of the body. Scientifically we have learned that colors, put off heat waves of energy that will heat up the inner body when the mind thinks about colors. In other energy methods people are able to use colors, since they are not cultivating large amounts of biophotons directly affecting the nerve fiber system like we do in our method. Learn how a current 2nd Year student in the School, used her chi energy to heal her own body from some nasty burns. Listen to how her chi training helped her to turn a very bad situation into a healing one. Listen to Sifu Cicero explain that these type of events are not unique, but are actually expected occurrences, while learning high level chi techniques. One of the more interesting things about chi energy is the fact that we can both generate and harness electricity in the form of bio electricity, which is something that is akin to playing with fire. Much like a power surge that takes place when a lightning strike hits a power plant, running higher and higher levels of current (bio electricity or otherwise), through our bodies can have unwanted side effects; however, when mindfully guided, we can change over and use this very same destructive force to enhance and improve our lives. Recently I came across an article that reinforced instruction that Sifu Jones has given time and time again. The article, “Pain Really Is All In Your Head And Emotion Controls Intensity” by Jon Hamilton speaks across multiple levels and depths of understanding. As previously mentioned, running additional electrical current throughout our body is generally speaking, an unpleasant proposition. The ability to control the attributes of electricity, including how it feels both emotionally, as well as by temperature, seems somewhat counter-intuitive. The feelings associated with the electricity, at least the degree and intensity thereof, it would seem, are completely and truthfully up to us as practitioners. As indicated by the title and reinforced by Sifus Jones and Cicero, our emotional content controls the intensity of the physical byproducts and impacts of the electricity we run throughout our bodies. Referencing horrors of war, the researchers used information provided by the CIA noting that unscheduled or seemingly random acts of torture had a greater impact than that which is scheduled. It reminds me of my early days of training, when I was actively and unknowingly torturing myself with yang energy. Even then, Sifu Jones encouraged me to perform my chi training at the same time every day – it would give my physical shell a sense of normalcy and be able to relax into the training without going into shock as to what was taking place. When training, we should also be gentle to ourselves, with our words and feelings towards our host bodies. Although humiliation is specifically referenced in the article, humiliation itself comes in many forms, two of which that are most common in our circle: self-deprecating humor and negative self-talk and thoughts. While it is always good to strive for excellence, we must become and remain soft judges, for ourselves and others, so that we have time and opportunity to learn and grow. Although the human body is by far the most advanced creation in the Universe, it is not without limits and has a learning curve. And although it can adapt to many circumstances, doing so often comes at a very high and expensive cost. By encouraging the body and gently speaking words of encouragement, we can alleviate unnecessary physical and emotional pain and maximize growth in the areas in which we are training (also see British Scientists Spot Brain’s Pain Center). If we combine these nuggets, to perform our chi energy training at the same time every day while speaking kind words to ourselves, we will be that much more successful in making sure the energy we cultivate is good feeling & cool. 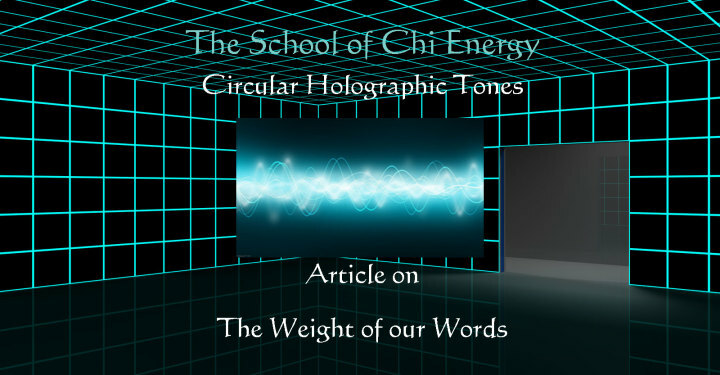 The School of Chi Energy discusses below how the latest in science discoveries supports how high level energy work affects the tone of our voice. Recently I came across an article that explained to me, in great detail, the importance of being mindful with regards to our tone of voice and; why Sifus Jones and Cicero place great importance on this concept for those of us actively engaged in this training. Over the years, I have found myself the recipient of negative feedback in one form or another, both at home and at the office. The need to recalibrate, especially with regards to temperature and softness of chi energy forms, was something that I was readily able to grasp. Sifu Jones pointed out several times that, regardless of my intentions or word choice, I was undoing myself. It was more often than not that the cause of my woes was directly related to my tone of voice. I had an intellectual understanding of sound being a mechanical wave, and that this particular method of chi training would excite these waves exponentially. Even with the haptic feedback, as it were, that I would experience from those on the receiving end of my words, I did not have a true understanding until recently. Without being mindful of my tones, I was not controlling the subsequent electrical magnetic energy forms being created by my sound waves with my own tone of voice. For most people in day to day life, physically feeling the words spoken by another human is something that does not intuitively makes sense. It hurts our sensibilities. Left haphazard, the beneficial results of the School of Chi Energy Circular method will have the reverse effect and tend to be similar to pointy javelins as opposed to soft and comfortable blankets that envelope and snuggle. On a conscious level, they may not understand what is happening, but subconsciously, they understood that whatever the discomfort, I was the cause. And even now, although what feels like I have had a moment of clarity; I am thinking I have finally been able to perceive the tip of this particular iceberg. I am excited now more than ever, as I can see the importance of using the correct energy healing tones and forms when speaking. Knowing that shapes can be formed out of sound waves, methinks it is time to stack the deck in everyone’s favor. Win. WIN! Be well and; enjoy the journey. Instructor Sifu Brown from The School of Chi Energy discusses below how the latest in science discoveries supports light seen at the invisible level. I recently came across an article that explained a phenomenon that I began experiencing personally; one which Sifu Jones assured me would take place over time. Earlier in my Chi Energy training, Sifu Jones taught me to “visualize” and build chi energy into specialized forms. Chi Energy is bioenergy, which are biophotons a form of light. He further explained that, in conjunction with the attributes of the energy form, the form itself is built by the clumping of the subatomic particles. It was difficult to visualize the form, holding the image in my mind’s eye; equally as challenging was being mindful of the cool temperature and good feeling attributes. I was skeptical, quietly convinced that I would never really “see” the biophotons and that the end goal would be a very clear mental picture of the image I was visualizing – nothing tangible regarding my physical self. One of my favorite things that Sifu Jones said to me during my early days of training was: Follow my step by step method, and if you can, prove me wrong. Many times I have had to go back to him and apologize, having been unable to do so. Following his instructions, everything he has said has certainly come to pass along with being able to see the energy forms with my physical eye. This has been happening for some time now, and I recently came across an article that explains that which is taking place – further proving the science behind Sifu Jones’ methodology as not only sound, but ground breaking. The concept of “packing photons together” is a recent echoing by the scientific community of Sifu Jones’ instructions of clumping biophotons together to create a chi energy form – instructions he provided me at the beginning of this journey. The same process, he assured, would also enable me to see the form. It is natural to experience challenges in any curriculum. This is no different; in fact, I would wager more so than most. I would suggest that, during periods of what seems like stagnation, we quietly resolve to follow the roadmap of instructions provided by one who has gone before us; and smile, as the breakthroughs of professional scientists and the accompanying technologies confirm the truth which Sifu Jones has been living and teaching for years. 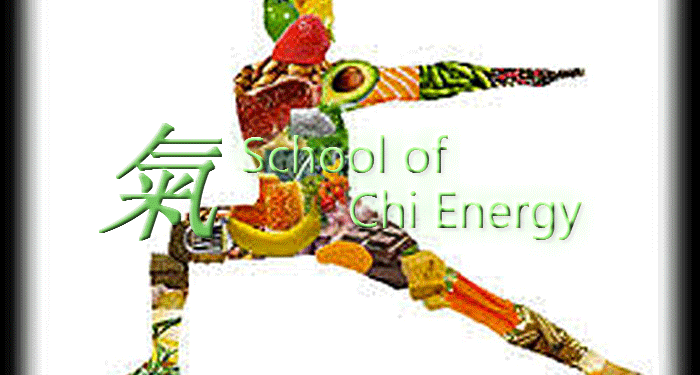 We get asked by our students at the School of Chi Energy what are the best type of food choices while chi energy training on a regular basis. My answer to my students is sometimes confusing at first, especially if they are first getting into energy work. I tell them that their own body will help them dictate what is good for them, after practicing the energy exercises we teach in our School. Students will tell me later after a few months training that they were surprised to find out that what I told them was true. As their body started building up more energy thru enlarging the nerve fibers thru the regular practice of performing the energy exercises they were learning, they realized they were becoming a lot more sensitive. The energy exercises they learn to perform in the school, tend to make a person very sensitive to their surroundings & to the inside of their own body; then, as a result of this new found sensitivity they start being able to not only taste their food, but later on to feel exactly what that particular food is doing to their body. When this sensitivity process starts happening, most people will automatically start treating their body so much better, by eating better kinds of foods. Most people are already aware they need a certain amount of protein, carbs & fat in their diet for it to run their body smoothly, so as the changes in sensitivity become real to that individual, that is when I advise them to start looking into what they are specifically eating. Usually trying to change your diet in any meaningful way doesn’t just happen, unless there is some kind of a significant event or traumatic situation that would cause that person to make that change. When you can start feeling what you are eating, it provides the incentive needed for a person to start looking to make those changes in food habits. Many people believe what you put into your body is going to determine what you will ultimately get out of it. We believe that is true too, but we also include as determining factors, your thoughts and the way you think about things; as the way you think will also determine how well your body will work for you too. With that said we do have a Chi Energy Nutritionist that has provided our students with the best type of food choices that is now available for the public to view. Please click this link to listen and find out what healthy food choices are available for the energy worker at the School of Chi Energy Nutrition page. The best way you can help your body are performing the right energy exercises on a regular basis, along with providing your body with the proper nutrients it needs to thrive. It is much easier to reach the higher levels at energy work when you doing the things necessary to reach there in the first place. A school like this one, which specializes in getting a person to the higher levels in energy work, teaches students those key ingredients it takes to become a professional. 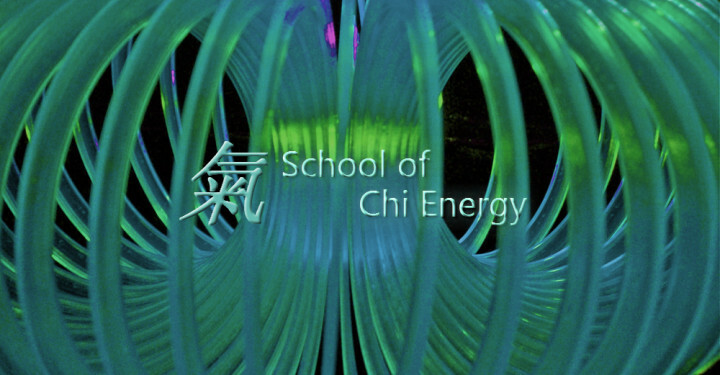 Check out our School of Chi Energy online training and see how we can help you teach your body to reach it’s full potential. Chakras and Nerve Fiber Building are all part of the type of Chi Cultivation at the School of Chi Energy. Students first learn that how to perform an energy exercise to build up high levels of biophotons using their body’s own entire nerve fiber system. Chi Students practice the daily nerve fiber building energy exercise that engages the release of biophotons from the nerve fibers which then mold into a tangible “energy form”. Students learn how to utilize these ‘energy forms’ with the transfer of a good feeling and cool temperature into the biophotons to perform advanced abilities and healing techniques. There are energy modalities that do teach a student how to move around their chi (liquid chi), but they do not teach this unique technique of actually forming the chi “into place”. 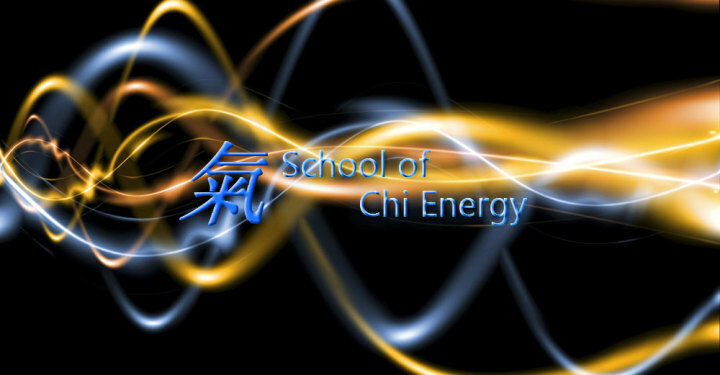 The School of Chi Energy teaches Students how they can build up large quantities of energy in a safe manner. Students are able to reach the higher levels in energy cultivation by learning a specially designed energy exercise called, “The Nerve Fiber Building Exercise”. Students learn these type of energy exercises in order to perform a quantum healing or extreme abilities. Learn how students perform this Energy Exercise to increase the size of their body’s nerve fibers, which helps the body to release more bio-electricity. Listen how the regular practice of this exercise lead students to have more chi projecting abilities than ever before. Learn how our students avoid bad side effects through using the right approach to building up energy in their own body. Find out why most energy systems don’t talk about pheromones or your body’s immune system and/or how energy work can directly affect them. What Type of Person Makes the Best Energy Healing Student? We are often asked by people, what type of person makes the best kind of student for The School of Chi Energy? Which type of student excels the most in a school like this? This short mp3 answers those questions and more. We suspect quite a few people will be surprised by the answers they hear. Check it out, by listening to the embedded mp3 below or download the mp3 for your convenience. Is Radical Change the Answer with Increasing Chi Energy? Colors play an interesting role in chi development, so much so that a myriad of terms and theories around the importance of and integration with specific colors and color patterns has woven its way into the exotic terminologies of chi development over the centuries. Sadly, although their intentions were good, the originators of heretofore chi-color theories did not benefit from nor have access to the information produced by 21st century scientists. Fortunately, we do. As demonstrated in the article “Energy Healing & Wavelengths from the Sky”, colors are components of the spectrum of [white] of light. What is not widely known that although the eye is the sensory mechanism that registers the electromagnetic energy that is light, it is the brain that assigns light its corresponding color value: the brain determines color, not the eye. Through a technique called binocular rivalry, the researchers from The University of Chicago and Vanderbilt University were able to trick the brain by presenting a different image to each eye, thus scrambling the communication between the eyes. 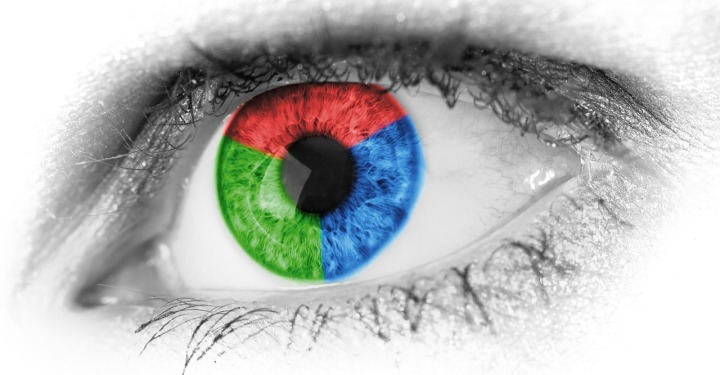 Instead of both eyes seeing in unison, the eyes were sending divergent and competing signals, and caused the brain to show its true colors [pun intended]. In the article “Chakra Healing Energy & Colors…”, the importance of the correlation between chi training and that it is the brain that interprets/assigns color is made readily apparent. As noted, the colors associated with the Northern Lights are a direct resultant of interaction between the electromagnetic field and various ions/charged particles available for consumption; “blue”, for example, is a result of large amounts of a charged form of nitrogen in the atmosphere. Minerals play a very important role in the well-being of the human body, each mineral and combination thereof having key roles and attributes. The Massachusetts Institute of Technology lists 22 minerals in the composition of the human body; the Blood Index Organization lists 44. Often, the sources for these minerals come from the foods we consume. All this is to say that, the brain uses the minerals in our own bodies to constantly assign colors to our everyday world. Again, the “blue” we see in the Northern Lights is a result of large amounts of a charged form of nitrogen in the atmosphere; in the process of interpreting the frequency of the electromagnetic signal communicated by our eyes, the quantum computer that is our brain “burns” the same minerals and combinations thereof to effectively match the signal, and provide us with a resulting color; this is why red is red, and not blue.